Celebrate with the South Wedge! Thanks to an ever-growing number of winter traditions to which the whole neighborhood (or city) is invited, the South Wedge will basically be one giant holiday celebration on Saturday, December 1st, 2018. Get ready for a holiday celebration designed to showcase the best of Rochester’s vibrant South Wedge neighborhood by featuring local businesses, highlighting the commercial district, and offering the best in local entertainment, vendors, food, and drink. The free It’s a Wonderful Life in the South Wedge event draws more than 4,000 visitors to the Wedge each year. Come down between 11 am and 4 pm, bring the whole family, and wander the neighborhood and you’re sure to encounter old friends, make new acquaintances, and find something for everyone to enjoy. 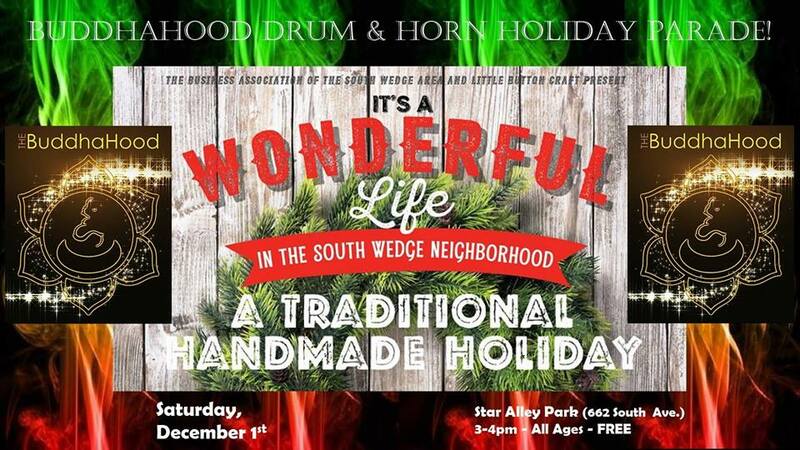 Star Alley will be decorated in a classic Christmas theme with pine boughs and decorations. There will be children’s crafts and activities, as well as holiday-themed games that appeal to all ages. Rochester’s favorite food trucks and iconic South Wedge eateries will be on hand with festive foods and drink specials. A lineup of four musical groups features Matt Weisner, Resonanz, The Flower City Pride Band, and local favorite The Buddhahood. Local businesses will provide the backdrop and be open throughout the event. A Handmade Holiday is back again for your alternative shopping pleasure from 11 am to 4 pm and will be housed as usual inside The German House and St. Boniface Church. Additional vendors will be located in Star Alley and Odd Fellows Hall (Didn’t you always want an excuse to go in there?!). At PrintRoc, you’ll find Food trucks and Christmas trees on offer, and Abundance Food Co-op will be hosting children’s craft making and yoga sessions. Santa Claus will be making surprise visits at each of these participating locations. When the clock strikes 3 pm, make sure you’re back at Star Alley Park (662 South Ave.) for the Buddahood’s Drum & Horn Holiday Parade. Everyone will gather for a musical parade and toasty fire to celebrate the holiday season. It’s sure to be a BLAST! Expand your celebration to Rochester’s oldest movie theater, warm up, and take a load off for a few hours. In connection with the day’s other activities, The Cinema Theater will be showing the holiday classic It’s a Wonderful Life starring James Stewart and Donna Reed at 4:15 pm. Head down right after Buddhahood – just make sure you leave Star Alley in time!